Tuesday’s State of the Union address was a triumph for President Trump. It was, subjectively and objectively, the best speech of his presidency. 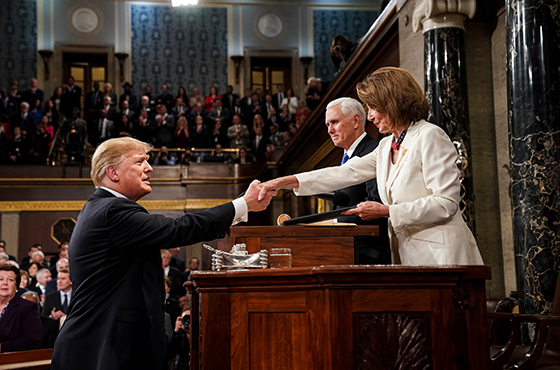 From its opening stanzas it was clear that the president made the right decision when Speaker of the House Nancy Pelosi disinvited him during the budget shutdown. Many on the right were calling for the president to send a written message to Congress while holding a public, rally-like State of the Union event somewhere in the heartland. The president held out for the House chamber – with its attendant majesty and tradition. It was the right call. Expect to hear that line a lot in 2020. Expect it to resonate with many Catholics who voted for Hillary Clinton in 2016. Bernie Sanders’ grumpy mug notwithstanding, that line drew extended applause. But so did the president’s reminder that on the 100th anniversary of women’s suffrage in the United States, there are more women in Congress than ever before. Even Nancy Pelosi and her posse of vestals clad in white had to stand and applaud that one. A beautiful theme beautifully delivered. More of that please, Mr. President. It works. Hello, MasterCard? Can you raise my Uncle Sam’s credit limit? Glory, no matter how great, is easily lost. I couldn’t agree more! President Trump laid down at least four of the foundations that make this country the greatest and most successful (prosperous) in World History. He pledged his best to protect and advance the following: 1) God given Human Life (both born and unborn), 2) the Sovereign borders of this country and the magnificent agents that protect us, 3) our magnificent Military and its heroes that also protect us and finally, 4) the Freedom or Right of the Individual to pursue Happiness (Prosperity) by supporting the Free Enterprise System (Capitalism) as opposed to Socialism and its legalization of government theft that ALWAYS destroys National prosperity. His real life examples to support these and other goals were the highlights of this incredible speech. Bravo, indeed! Paul, I agree with your take on President Trump’s address to the nation. An impressive deliver with welcome content by any measure. Not bad for a guy liberals/progressives and their media lickspittles see as incompetent and insane. I watched the state of the union speech mostly on Fox and OAN, but bounced between those two channels and CNN and MSNBC in order to get the left’s other-side-of-the-moon take, both just after the speech and later in the evening. No suprise there. A Congessional Democrat explained the 70% ranging favorables for the address by saying only Trump’s base watched the speech. And a commentator, the supposed house “conservative” at one of the big liberal papers–WP, NYT, whatever–panned the whole speech as uninspired and lacking ANY memorable sound bite or idea. So much for the head-in-the-sand left. On the other side, any fair-minded observer has to give credit where credit is due. In his state of the union address, President Donald Trump was in every way presidential except in one–he is the first president to speak honestly to the American people since Ronald Reagan. Applause to WHOEVER got him to — for once — stick to the dang script. Which is not to say he won’t step on his own tail via Twitter now. I’m glad that you are looking out for President Trump’s best interest by praising the puppet master that kept him on script. Maybe his Twitter tail will be tied around his back along with “half his brain” as he demolishes the Democrat Socialists and their Tyrannical dreams of OPEN borders and an establishment of a dependent and 3rd world culture. These Leftists intend to form a culture that needs a SUPER STRONG government in order to rule over the anticipated flood of “undocumented” new Democrat voters (illegal aliens). They need a subservient level of humanity that believes that their “Rights and Freedoms” come only from that all-knowing and “benevolent” power-hungry Government. It is a Logical Rule-of-Nature that the stronger the ruling Government over Humanity, the weaker the Rights and Freedoms of the Individual! It is no wonder that the despicable far-Left Democrats subordinate our Property and Individual Rights (including those of infants) to that of the STATE. Their vision for the STATE has become the epitome of their adoration for the COLLECTIVE: their omnipotent IDOL and replacement for God. Anytime President Trump receives a 76 % approval from CBS & CNN snap polls for ANYTHING, one has to admit that the SOTU message was well-received! Although there will always be those not willing to give him credit for leading our country in the right direction, drastic improvement in all of the major indices and opportunities plainly reveal a pathological lack of integrity and an abundance of pettiness. Now, let me be a little petty,…….I hope that Speaker Pelosi will find enough funding in the budget to purchase a supply of dental floss, as it appears that she is constantly trying to remove food particles from her teeth. The incessant contorting of her lips is almost as distracting and disgusting as what she has to say! What a small-minded thing for me to say; could I be turning into a Liberal? So now we BELIEVE polls? It’s hard to ignore a poll that clocks in at 76 percent. Next story Give him a pass (on this one). Previous story How far we have fallen.